My family got our first color TV to watch the seventh game of the 1987 World Series. I remember that I fell asleep half-way through the game. I remember the names so well: Kirby Puckett, Frank Viola, Gary Gaetti, Kent Herback, Greg Gagne, Dan Gladden... I have all their cards still, I think, somewhere in my parents house. Kirby Puckett was a kind of superhero for me. So big, so capable. I will never forget stepping into the outfield stands at the Metrodome and being shocked by how big it was and how vivid the colors were. What I saw on TV was even more majestic than I had thought. And I was smaller, holding on tightly to my father's hand, filled with awe. 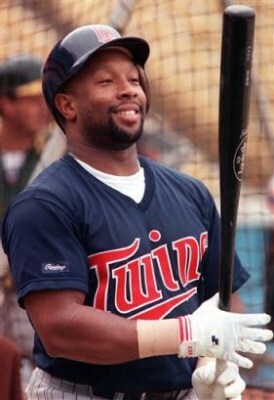 Kirby Puckett, I will remember you as you were: a giant, a leader among the best, and a hero--my childhood in navy blue and bright red — because every time I hit a tennis ball into the woods behind our house, I imagined I was you.